I’m a big believer in budgets. No matter how much money you have, if you don’t know where it’s going, it will run your life. As Dave Ramsey says, tell every dollar where it’s going or it will tell you. Okay wait I just googled it and nothing came up so maybe I made that up? Whatever! Either way, I’ve found it’s true. I have a hard time categorizing my spending habits, because as soon as I classify myself as thrifty, I find a pair of $200 boots that I’m ready to splurge on. Instead of calling myself a penny-pincher or a big-spender, I’ll tell you how I’ve found the balance between the two. I enjoy fashion and shopping, and I love when it happens guilt-free and within my budget. Here’s how I do it. Instead of thinking about shopping every day or every weekend, I shop seasonally. I look to the current trends to see what pieces my wardrobe needs for each season. Plenty of pieces from previous seasons will transfer over and I look for ways to sprinkle in new things for an easy wardrobe update. This way, I’m not adding random shirts or shoes that don’t make sense within my current wardrobe. Your rules will surely look different than mine, but here is what I ask myself before I commit to a purchase. Do I have the proper undergarments for it? Does it go with shoes I already have? Is it comfortable? Is it true to my typical style? Do I feel great when I put it on? Is it one of my favorite colors? If any of these answers are a no, then it goes back on the rack. 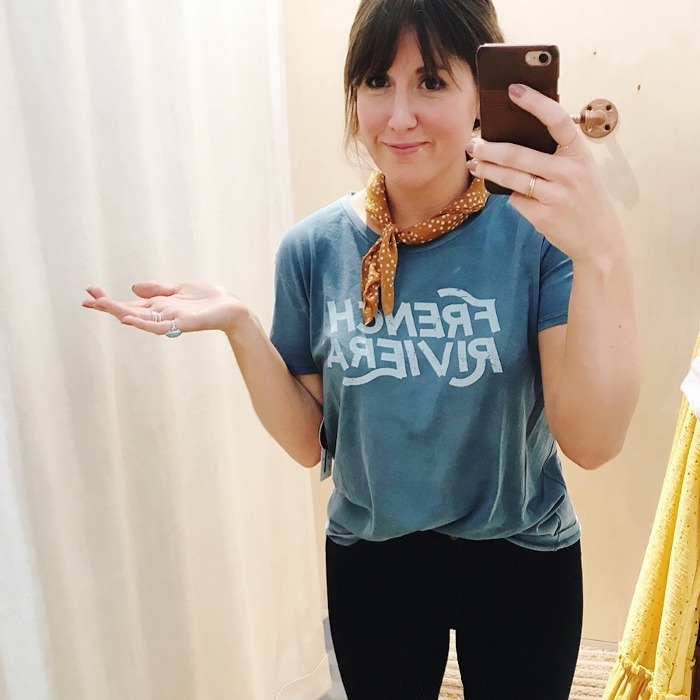 When I started StateMint five years ago, it was born out of a desire to shop practically new, current trends on a budget. I knew tons of my friends who had great things in their closet that they were never going to wear again, and it was true of my closet as well. StateMint became a way to earn some money from things we have invested in, and to shop great brands at great prices. I’m counting down to the next event! My wardrobe is ready! Okay, you might think I’m crazy. Or maybe, just maybe you do it too?! When I get the urge to shop unnecessarily, I love to waste time shopping on my favorite apps like Free People, Zara, Anthropologie. The word shop should be in air quotes because I don’t actually purchase these things. I just mindlessly add everything I like to the cart. Then when I’m done, I take a look at the cart and realize how ridiculous it would be to spend that much and I walk away. I do leave everything in the cart because every now and then, when I come back to look at it, certain items will be on sale. Maybe it will be something I love enough to actually get? Or maybe when I’m a week or two removed from my shopping urge, I’ll realize I don’t even really like or need it anyway. Whether you’re a budget shopper or a big spender, having things hanging in your closet that you’re never going to wear is a total waste. Maybe you need to change your shopping habits or just find a place for your unused pieces to go. Most consignors at StateMint earn several hundred dollars to either invest back into their wardrobe or even take a quick getaway to the beach. It’s the easiest way to earn money for things that are just taking up space your home.